Since they’re web based, they’re accessible to everyone, not just those who download a mobile app. Progressive Web Apps (PWAs) are a new way to deliver an incredible user experience across all devices by merging the best of the web and the best of native apps together. PWAs are multi-platform and bring features that have only been available in native apps until now to the web. Progressive Web Apps bring radically improved applications to the table that offer the perfect experience for users. The smartphone on the right is the PWA edition of our agency app that you can explore directly within this page. If you are viewing this page on your smartphone, tap the image to open the PWA on your device. The PWA works for every user, regardless of browser or device. The PWA uses responsive design so it automatically adapts to fit any device screen, such as: mobile smartphone, tablet, laptop, and desktop. The PWA looks and behaves like a traditional mobile app with similar navigation, features, and capabilities. The PWA uses encrypted HTTPS for increased security and a higher reputation on Google. The PWA is always up to date and readily available. New updates are instantly available within the PWA, as compared to native apps which require users to return to the app store to install the updates. The PWA remains functional when the device connectivity is offline. Users can easily locate the PWA through search engines like Google and Bing. The PWA can easily be shared by a link on your main website, Facebook page, Yelp business page, email marketing campaigns, or other social media platforms. Why Choose a Progressive Web App? PWAs do not need to be installed through any app store! This allows you to make your business easily accessible and eliminate the constraint of having to install the PWA as a traditional native app. Your PWA will appear in search engine results and increase the visibility of your business. Optimize your SEO and take advantage of a level of discoverability far ahead what the app stores can offer. PWAs work on any device, and adapt perfectly to any screen size. They can be used on smartphones, tablets, or desktops. Traditional native apps are typical only Android or iPhone-based. A Progressive Web App can seamlessly replace your main website experience for mobile visitors. 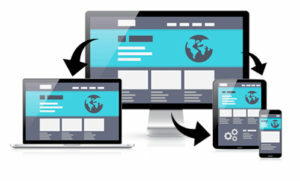 When a customer visits your main website on their smartphone web browser, the website should be able to automatically resize and adapt to any small screen size. This is called Responsive Web Design. If visitors encounter difficulties navigating a website, the business could be losing page views, reducing the number of customer visits, and ultimately less revenues. Google ranks responsive websites a little higher in search results to benefit mobile users. Is your website mobile friendly? Click the button below to test it with Google. The quickest solution is to use a PWA for all of your mobile website visitors. This can easily be accomplished by routing mobile users to your PWA by using a subdomain. Mobile users will now see your PWA on their smartphone. The display will automatically adapt to any smartphone or tablet device for a fast and seamless experience. We help coordinate with your web hosting service to create the “m.” subdomain (which is typically free) and redirect the mobile traffic to your PWA. 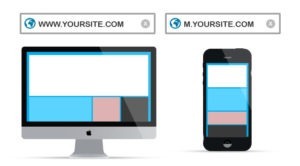 If your business website was created and hosted at Mythos Media, we setup the subdomain and redirect the mobile traffic. The entire process is seamless to your visitors and without any interruption to your main website. We also include free SSL encryption for the PWA subdomain for additional security and higher reputation ranking. An additional solution would be to implement a mobile friendly responsive web design on your main website. Mythos Media can help with this effort if you would like to discuss updating your website down the road. Both PWAs and Native Apps have their own pros and cons as you will see in the table below. Tap to add to device home screen. Need to go to the app store, accept permissions, download, and have enough available storage space. PWA needs to be accessed online only once. PWA will appear in search results. Users need to know the app name to locate it in the app stores. App store optimization can help discoverability. Sell ad space within your app using internal or external ad networks.